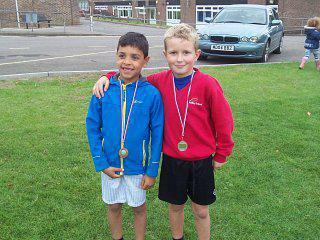 On 23rd September, 14 Botley students walked up to Matthew Arnold to take part in a gruelling Cross Country Race against 5 other schools. Students in years 3 and 4 had to run a total of 1000 metres and the students in years 5 and 6 had to run a total of 1500 metres. Although the ground was muddy this did not put off the Botley students from running as fast as they could. Overall the boys 3 /4 team came first in their category; the 3 /4 girls came 2nd in their category and 5 /6 boys came in forth. Well done everybody!